CHURCH HILL — When Dr. Reba Bailey woke up Thursday morning she had no idea she'd find herself being elected Hawkins County Schools interim director before the day was done. Bailey, who is one of two current assistant directors, said she’d start preparing for the job, reading and familiarizing herself with school policy, before going to bed Thursday night. Aside from being the one meeting per year held at Volunteer High School, Thursday's Hawkins County BOE meeting was also special because it was Director Steve Starnes' last regular monthly meeting at the helm. Starnes, who has worked at Hawkins County Schools for 30 years, including the past four as director, was appointed last week as the Greeneville City School director. 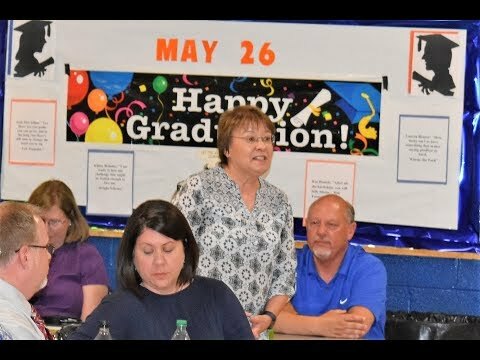 His last day in the Hawkins County Schools will be May 31. State law dictates that a school board cannot hire a new director 45 days before a school board election (which is Aug. 2 this year) or 30 days after an election. As a result the BOE won't be making any decisions to approve a new director at least until September. Without consulting Bailey, BOE vice chair Debbie Shedden made a motion as the last item on the agenda Thursday to appoint Bailey as interim director. The board has a policy that the interim director cannot seek the permanent position, and no one on the board had even asked Bailey if she planned on applying for the job. Before taking its vote, board chairman Bob Larkins asked Bailey if she planned on applying for the director position, to which she replied she was not. The board then voted unanimously to appoint her interim, and to bump her pay up to director level beginning June 1 until a new director takes over. Bailey is a graduate of the former Rogersville High School, and has been employed in the Hawkins County School system for 37 years. She started as a special education teacher at Bulls Gap School, and later taught English and Math. She was assistant principal at Bulls Gap School, before moving to the Central Office where she has served as pre-school coordinator, gifted and talented coordinator, and assistant director of special education. Aside form being assistant director she is also currently federal programs and testing supervisor. "I will probably start tonight," Bailey said. "I like to read things about school and research about education. I'm familiar with policies, but I'll probably review those." She said she's not interested in the permanent director job because she likes her team, and she likes what she's doing right now. The BOE will have a budget workshop Monday at 6 p.m., but the first item to be discussed will be whether the BOE plans on hiring a consultant to help find Starnes replacement.